Now that I have a big old collection of essential oils I have been able to make copycat Young Living blends to try some I don't yet have or which are too expensive for me. 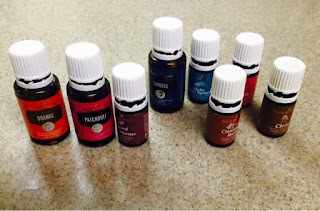 A few months ago Young Living was promoting their Abundance TM blend, which, according to Young Living's own description, "was created to enhance the frequency of the harmonic magnetic energy field that surrounds us. Abundance TM creates what is called 'the law of attraction,' which refers to the things we attract to ourselves. Abundance TM opens us to a wealth of possibilities." Even as a California native, this seemed like a load of over the top hippie BS to me, but I had all the oils in the blend but one and thought I'd see if such a thing could work. I put 10 drops each orange, frankincense, and patchouli, and 5 drops each myrrh, clove, cinnamon, and Idaho blue spruce, as well as cypress (my own substitution for the ginger in YL's blend) in a 5ml bottle and topped it off with grapeseed oil as a carrier. This combination smells fantastic to me. It conjures the happier moments of my childhood, bringing to mind the smell of tea in a tin my mother kept in the kitchen of our house in California before my father died, and the smell of my grandparents' house at Christmas time. I decided, regardless of the affect on my harmonic magnetic frequencies it makes a great perfume! On Saturday morning I applied some to my pulse points before our Girl Scouts cookie booth. Our booth, despite being located at the less busy entrance to Walmart, sold quite a bit more than the troop's other booth. Then I came home and had a neighbor come over to purchase some essential oil and tell me she wants to host a party because she thinks her friends will love Young Living. I thought, perhaps there's something this whole harmonic magnetic energy field thing after all. I decided to wear my Abundance copycat every day. My eBay sales have been 100-200% higher than the same day last month all week! Is it coincidence, or can you really attract wealth to yourself? I do know, most of the oils in the blend are good for boosting confidence, so maybe I'm just getting out and doing more to make myself successful because I feel better about myself. At any rate, I'm going to keep using this oil blend and might even try the actual Young Living version! On Tuesday necessity made me produce another copycat Young Living blend. The day started out so cold and icy school was cancelled, but then the weather turned and it was 60 degrees by noon. These big swings in temperature have historically caused me to have terrible sinus headaches and migraines. It's been so long since I had regular migraines, however (over a year to be exact, dating to the initiation of my use of 4 drops of Progessence Plus inside my wrist every morning) I forgot to be on the alert. I hadn't felt very well when I woke up a little after 5 that morning to take the puppy out. I dosed myself with my homemade cough and cold rub and put a few drops of Thieves in my coffee and took a nap and after lunch I felt well enough to get in 5 miles walking in just over an hour. I should have been paying attention to a tiny gray dot in my right field of vision, but I ignored it. My grandfather, who also had migraines, called this a "shadow" in his eye and whenever he got it we dropped everything so he could head home to bed. But like an idiot I just thought I'd been wearing my contacts too long. By suppertime when I was trying to cook supper I suddenly had "lights" like an old 70's flash bulb going off in my eye so bad I couldn't see at all out of my right eye. After I tripped over the puppy, ran into the wall and a table, my husband and son took over making supper and I went to get my oils. Earlier in the year I made a copycat M-Grain blend. I thought about buying it from Young Living but it's expensive and I only had three migraines all year in 2015 so making my own seemed smarter. (Incidentally, I find it really funny that all the M-Grain description says is that it produces a feeling of well-being, whereas the Abundance says it affects your magnetic energy fields... whomever writes the product descriptions must have feeling far less poetic on M-Grain day!) Well, when we went to the beach in October my stepfather was hospitalized the first morning with severe abdominal pain. They ran all kinds of tests and couldn't find anything (I am pretty sure he had the same virus that mimics appendicitis my daughter had last year). They sent him home with morphine, but he said it wasn't touching the pain. I didn't have my whole kit with me, but I'd thrown my copycat M-Grain into my bag before we left and it was the only pain relief oil I had. I told him to rub it on his abdomen over the painful spot. It worked so well he took my M-Grain and I've never gotten it back! So I had to make another copycat blend Tuesday night. I was so blind and sick I didn't pay much attention to the proportions, so I'm just guessing in this recipe. The main ingredient in YL's blend is basil, which I don't have, so I mixed 20 drops each wintergreen and Roman chamomile and 15 drops each marjoram, lavender, peppermint, Dragon Time and PanAway in a 15 ml bottle and topped it off with grapeseed oil. In my original version, which my stepdad has, I used flax seed oil as the carrier because it reduces inflammation. My husband moved the flax seed to our second fridge and I was too sick to go find it so I just used grapeseed that was in the regular fridge. I add the Dragon Time because my migraines often have a hormonal component. If you are male and suspect hormones are causing your migraines I suggest substituting Idaho Blue Spruce, Mister, or Shutran for the Dragon Time, as all these blends help support a healthy balance of male hormones. I rubbed my oil blend all over my head and jaws and neck. Then I put the same combo, 8 to 4 drops each, in the diffuser, took 3 drops of DiGize in water, put an ice pack on my head and sat with my eyes closed next to the diffuser until supper was ready, about a half hour. By the time we ate, I could eat and I could see again. This is crucial, because usually if I don't catch a headache before the visual disturbance called the "aura" (the lights in my eyes) starts, the puking and pain comes on pretty fast and lasts for 2 or 3 days. Since Tuesday (it's Thursday now) I've had a dull headache and still have a tiny gray spot in my eye but when I apply my M-Grain it subsides to the point it's bearable. I've continued to work out and to work on my businesses. In fact, I made another Kitty Kapers cat this week and have it for sale in my eBay store! Finally, last week I ran out of my Young Living Thyromin vitamins. I take these to support my thyroid health because thyroid disease runs in my family. I only take one pill a day and just finished my second bottle. I wasn't sure if it was really doing anything, so I let the pills run out. Well, besides getting a migraine, which is unusual for me now, I've been super sleepy and my weight has crept up a little even though I've been trying to really stay on track in my health and fitness group. I think the Thyromin was doing a lot more than I realized! 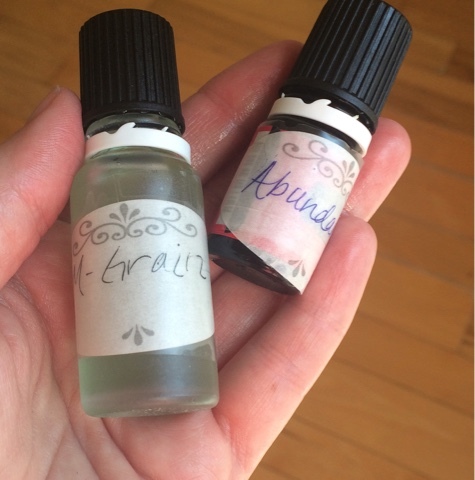 So I have more on the way, but in the meantime I'm rubbing a combination of a few drops each clove, myrrh, lemongrass, and peppermint directly over my thyroid once a day and using Endoflex twice a day to help support my thyroid's healthy function. I just also want to mention Young Living is having an incredible sale right now. Premium Starter Kits are 10% off. I finally ordered one with the Aria diffuser I've been lusting after! Existing members can order the PSK, so it's a great way to get a sale price on oils and a new or different diffuser. You can replenish your set if you're getting low! Shutran, for male hormone balance, is also on sale, as is Ningxia Red! Order from me and I'll send you recipes using the oils in your kit and add you to some exclusive private online oil forums on Facebook and if you order the Ningxia, I'll add you to the health and fitness group that coached me to an 11 pound weight loss in January! Years and years ago, in the 1970s, my grandfather became interested in woodworking and set up a shop in the basement from which he turned out everything from rocking horses to Christmas ornaments. I guess really he was always good at building things. When he was a teenager he and his brother decided their house needed extra space so they decided to add a basement. They jacked the house up on stilts and dug a basement underneath with shovels and then set the house back down again. While the house was elevated it began swaying in the strong wind and my great-grandfather, a Norwegian man of few words, took his pipe from his mouth and said, "Well, now you've done it." The boys finished the basement, however, and it is still in use today as part of my cousin Realpha's house. I'm sure it added a lot of extra space to the house, which is quite small and housed a family of 10 in my grandfather's day. My mother can remember when my grandfather built the staircase in her childhood home. There was just a ladder to the basement for a time until he built and installed a staircase all by himself, I believe. One of my great uncles may have assisted him in installing it. He also laid the floors and paneling in that house and built in captain's beds for the children and bookcases and cupboards all over. Somehow he seemed to have picked up all kinds of skills without any formal training. 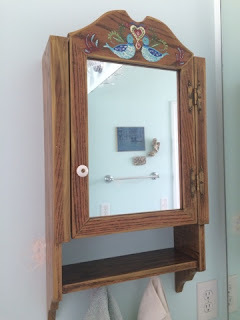 I guess he could probably make a little medicine cabinet in his sleep, so when my mother asked for a wooden one to complete her paneled bathroom he agreed. As I remember the walls in that powder room were paneled in ebony boards and the floor was some kind of brown vinyl. I think maybe it was patterned to look like bricks or stones. There was a shaggy latch hook wall hanging featuring trees under a full moon. My grandfather built a wooden cabinet and stained it ebony to match the walls, so you can imagine, the room was the height of 1970's design! Fast forward to Christmas of 2015, and my husband and I have really been wishing for extra storage space in our master bath, especially for small things like toothbrushes and makeup and stuff. My husband was up in my parents' attic putting Christmas decorations away after the holiday and saw the old wooden cabinet up there. It was deemed too outdated to hang in their remodeled bathroom. We asked if we could have it and they agreed so we brought it home with a plan to paint it. 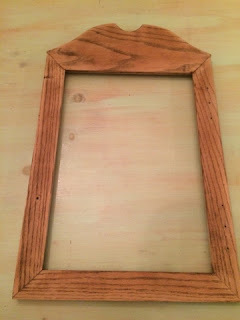 My husband sanded off the dark stain and I really liked the unfinished wood. Our furniture is mostly painted, so I thought some wood grain might be a nice thing in the house. I told him to just stop and leave it as it was. 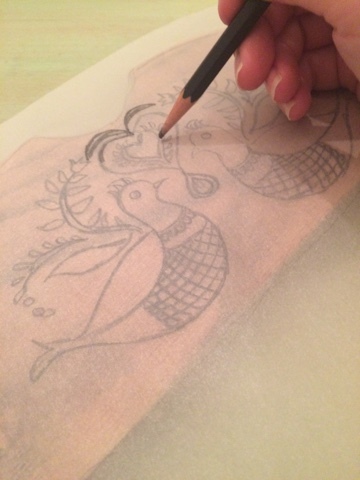 I used tracing paper to lay out the design. I transfer the design from the paper to the wood. I thought the bare wood would look nice accented with rosemaling and gold wax. When we moved to North Carolina in the 1980s we brought the medicine cabinet to our new house. The powder room there was blue and my mother collected several ceramic and glass blue bird decorations and displayed them on the open shelf of the medicine cabinet. I wanted to feature blue birds but still wanted rosemaling since my Norwegian grandfather made the cabinet, and I wasn't sure if rosemaling ever featured birds. I found a book of traditional Scandinavian decorative motifs and did see a few that featured birds, so I decided it would work. 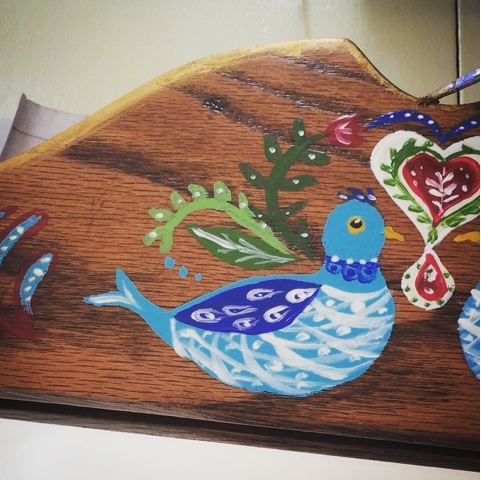 The birds I drew are more like blue quail or peacocks than bluebirds; a nod to my California childhood when we saw quail around our house all the time. After the paint was finished I applied gold wax as an accent. I used acrylic artist's paints for the rosemaling. It's funny; my Midwestern friends think the painting is Pennsylvania Dutch like the Hex signs and my friend from Budapest thinks it looks like Hungarian folk painting. It just goes to show how very similar are the cultures, I suppose! After I finished the paint my husband applied a few coats of polyurethane to the whole thing. Then I went back and accented the edges with Rub N Buff gold wax. 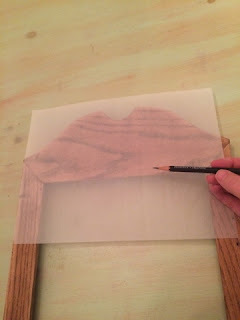 The wax tends to run if you apply it before the polyurethane. 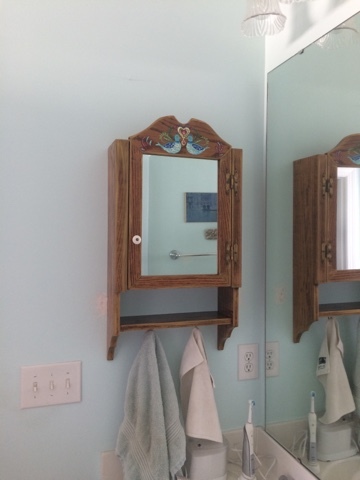 As you can see, the cabinet adds some personality to our otherwise plain Jane, straight from the builder bathroom. I would love to update the bath and make it more functional for storage, but since our kitchen is literally falling apart (now the ceiling is getting water marks all over it, showing we will most likely have to rip it out to repair the plumbing from the bathroom above it) there won't be any money for cosmetic work on the bath for a very long time. We do still need to paint the wall where we had to patch it after removing a towel bar, but then the bath will be almost finished. I have a vintage curio shelf I want to repurpose as an essential oils organizer and display. That will be my next home project. The reason I haven't finished much of anything lately is shown in the photo below. 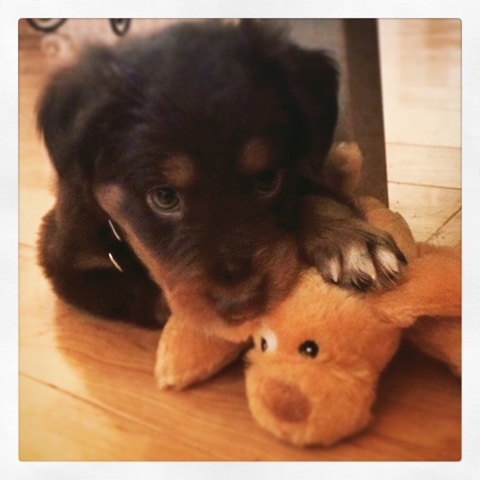 I actually started this blog post a week ago, but that coincided with the entry into our lives of Miss Luna, our Australian Shepherd puppy. She's actually about twice as big as in that photo already, after just a week and a half. Puppies last even less time than human babies, but that's a good thing I guess since Luna has only slept through the night once since she arrived and gets into everything so much during the day it's impossible to get anything done. I'm so tired I hardly know my own name! I definitely forgot what it's like to have a baby in the house. Hopefully things will settle down and allow me to complete some new projects soon.